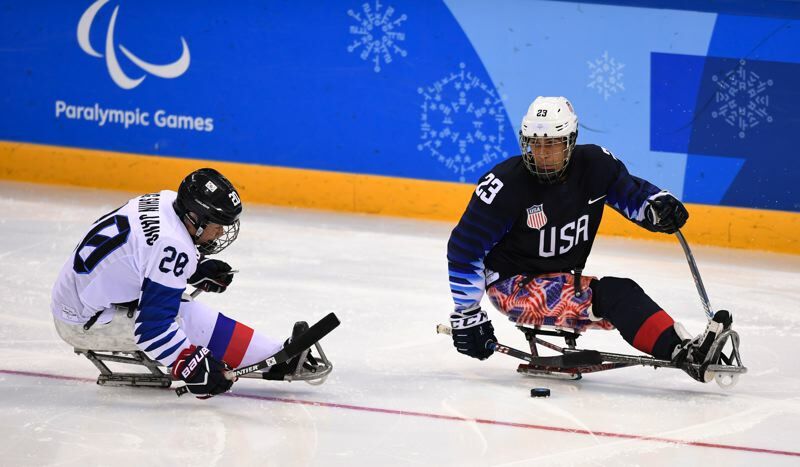 Even a couple of weeks after having a gold medal placed around his neck for the second time, Portland native Rico Roman keeps repeating the same word when talking about the dramatic way his United States sled hockey team won the Paralympic tournament at PyeongChang, South Korea. "We only won by one in Sochi (1-0 over host Russia in 2014), so that was tough, too. But to come back and win it this time was just unreal," Roman says. A USA victory certainly did not seem realistic as time wound down in the March 18 championship game. Canada led 1-0, and with the United States net empty in favor of an extra attacker, the Canadians' Rob Armstrong zeroed in on the goal. But his shot hit the post and caromed away. Seconds later, U.S. forward Declan Farmer found the puck on his stick and fired it home from close range. Thirty-seven seconds from settling for silver, Team USA had life. "The whole bench just erupted. That whole place erupted," Roman says. "When Declan got that goal to put it into overtime, we felt like the momentum shifted and we had them on their heels." He adds that Team USA was confident about the four-on-four overtime format. "We do a lot of four-on-four, three-on-three, two-on-two (in practice), so we really felt like we were going to get it," he says. Farmer finished the job 3:30 into OT, giving Team USA its third consecutive sled hockey gold medal and earning a second gold for Roman. Farmer had been on the ice since the start of the overtime. "He was on the ice for a long time. We were all kind of looking for the change," Roman says. "I thought for sure he was going to change, but it paid off with him staying out there and sealing the deal." And then they were all on the ice in a celebratory dog pile. A Purple Heart recipient who suffered severe injuries as a result of a roadside bomb in 2007 while serving his third tour in Iraq, Roman discovered sled hockey while rehabilitating after having his lower left leg amputated. He did not make the 2010 Paralympic team, but left those tryouts determined to make it next time. He has played for Team USA at three world championship tournaments and two Paralympics. A checking center whose role is more to disrupt than to score, the 37-year-old Roman scored his first Paralympic goal in Team USA's first game in South Korea, a tap-in that gave the United States a 7-0 lead in a 10-0 win over Japan. Teammates teased Roman that it was a trash goal. "The guys joked around that it was right on the line and all you've got to do is tap it in," he says. "A goal is a goal, and I was happy to be there and happy to put it in." He was also happy to be teamed on a line with two other military veterans — former Marines Luke McDermott and Travis Dodson. "It was really an honor to be a part of that line," he says. Roman was happy to throw around his weight. "The checking is part of the game and can sometimes change the momentum in the game so playing physical, that's definitely how I play," Roman says. Joined in South Korea by his wife, two children and his mother, Roman was thrilled to share a second Paralympic experience with his family. And he was glad for the opportunity to meet alpine athletes, something that did not happen during the Paralympics at Sochi, Russia. In Sochi, the hockey team stayed in the coastal athletes village near the ice rink. In South Korea, the village near the ice rink closed after the Winter Games, so the team stayed at the mountain village. That meant 45-minute bus rides up and down the mountain for practices and games, and caused occasional altitude illness. "We got to hang out with the skiers, the snowboarders and all the other incredible athletes up there," Roman says. "It presented different challenges, but at the end of the day it was just so much fun." Roman has never skied, but says he hopes to give that sport a try. Sled hockey has taken Roman around the United States for training and club competition. He plans to settle in Portland and help grow sled hockey in the region. Josh Sweeney, captain of the USA team that won gold in Russia in 2014, has lived in the Portland area and helped start a sled hockey program with support from the Portland Winterhawks. Roman hopes to build on that and establish a team that can represent the region in club tournaments around the country. For at least one more season, he will play club sled hockey with the Colorado Avalanche team. He will play for that team at a sports festival for disabled athletes later this month in Chicago, where some of his Team USA team will be on opposing teams. "I'm looking forward to that tournament and having fun with the medal, taking pictures and sharing it some of the younger guys that will be at that tournament," Roman says. As for his long-term sled hockey plans, Roman — who was recognized prior to the Winterhawks' March 24 home game — has not yet thought ahead to the 2022 Paralympic Winter Games. "I'm just enjoying the win," he says, "and I'm going to enjoy this (club teams) tournament next month and go from there."